Geese and ducks need access to water every single day. They need to clear their nostrils and spread their oils around their feathers, and water is the conduit for each of these. We have a small cement pond on the farm, it was here and cracked and had trees growing out of it when we moved here. Homer cleared it out, patched it, filled with water and added cover for goldfish. Every animal uses it whenever possible. 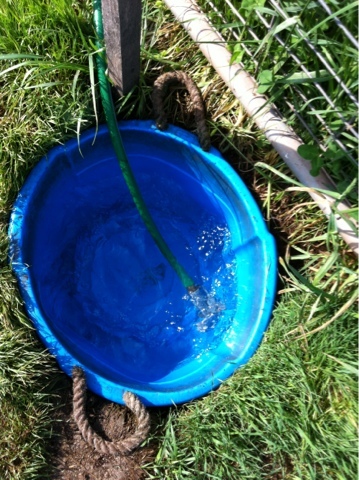 On other parts of the farm these simple tubs are used. Sunk in the ground they are our faux ponds..easy to manage, to refill and to clean out periodically..ducks and geese can be messy and quickly make water funky. The cement pond serves as a habitat for the frogs and toads to lay eggs. The same hiding spots for goldfish serve as hiding spots for the incubating eggs/tadpoles/spring peepers. Last night we could hear them calling all over the farm..the sound is one of my all time favorites. When I was a girl my father brought a recording of night time sounds in the Amazon forest home, and we listened to it on the living room stereo, lights out. My sister came home, arriving at the front door to a dark house with those sounds filling it, and asked what was going on. Then reminded us how uncool we were. I guess, in a funny way, that is still happening. She is in LA attending celebrity events, product launches, award ceremonies and the like and we are here, listening and delighting in the sound of peepers!